MGen. 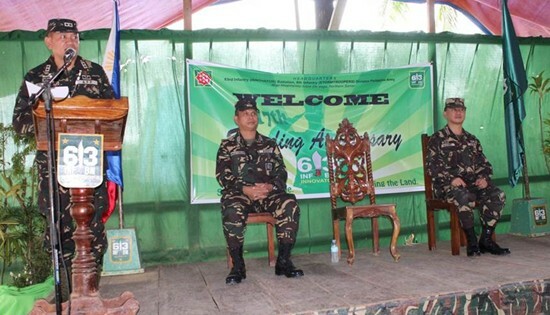 Jet Velarmino AFP, Commander 8th Infantry Division, Philippine Army giving his message during the 17th Founding Anniversary of 63rd Infantry (Innovator) Battalion at Brgy. Magsaysay, Lope de Vega, Northern Samar on March 30, 2015. CAMP VICENTE LUKBAN, Catbalogan City – The 63rd Infantry (Innovator) Battalion under the 8th Infantry Division, Philippine Army based at Lope de Vega, Northern Samar recently celebrated its 17th Founding Anniversary on March 30, 2015. Highlighting the activities is the presentation of awards to military personnel who excel in their respective tasks and the presentation of Plaques of Appreciation to the Local Chief Executives who contributed to the battalion’s effort in the 1st District of Northern Samar. It was immediately followed by a press conference conducted by the members of the local media. According to Lt. Col. Carmelito T Pangatungan, Commanding Officer of 63IB, the Battalion was organized on April 1, 1987 pursuant to General Order number 120, HPA dated March 27, 1987 and adopted the motto “Innovator”. Through the years, the battalion has served and participated in various anti-insurgency campaigns in Luzon, Visayas and Mindanao and has gained distinction in the accomplishment of its mission. The activity was graced by Major General Jet B. Velarmino, Commander 8ID, Colonel Herminigildo C Aquino, 803rd Brigade Commander, Mayor Ronaldo P Aquino of Calbayog, Mayor Rod Suan of Allen, Mayor Ana T Palloc of Lope de Vega, members of the Provincial Social Welfare and Development and the media. “The 8ID is one with you in celebrating your 17th year founding anniversary, thus, it is my great pride and privilege to be part of this celebration. Indeed, you deserve commemorating this important moment because this is where we give due recognition to the dedication of the officers and enlisted personnel of this battalion. Continue the good practices and tradition that your unit has started and remain as catalyst in bringing lasting peace and development here in the 1st district of Northern Samar. As your commander, I urge you to be the best in all your undertakings so that we will be able to achieve an Insurgency Free Northern Samar in the near future”, said Velarmino. CAMP VICENTE LUKBAN, Catbalogan City – Barely two weeks after being deployed in Maguindanao to support the 6th Infantry Division’s effort against the BIFF, troops of the 34th Infantry (Reliable) Battalion, 8th Infantry Division, Philippine Army drew its first armed contact with the Bangsamoro Islamic Freedom Fighters (BIFF) at Barangay Pamalian, Shariff Saydona Mustapha at 10:00 in the morning of March 29, 2015. Troops of 34IB were part of the units operating in Pamalian, Datu Shariff Saydona town when they clashed with a group of BIFF fighters. The encounter resulted to 13 BIFF killed while 4 casualties were incurred by the government side. Fatalities from the government side were identified as Corporal Faizal A. Julmain from Jolo, Sulu and Pfc Marlon S. Marino of Northern Samar. Wounded were Cpl Ireneo M. Bahian and Pfc Antonio B. Sanico. The remains of the fatalities will be transported by C-130 plane back to their hometown while those wounded are now recuperating at a military hospital in Cotabato City. It can be recalled that, the BIFF was involved in the Mamasapano clash on January 25, 2015, leading to the deaths of 44 members of the PNP Special Action Force. Following the tragic incident, the group engaged in some clashes against the AFP, prompting the AFP to conduct offensive actions against the BIFF. The 34th Infantry Battalion, based at Northern Samar was redeployed to Mindanao to support the ongoing operations against the BIFF and other lawless elements which had been undermining the peace in Mindanao. 8ID chief MGen. Jet Velarmino (3rd from R), Samar governor Sharee Ann Tan, Director Rey Gozon of Regional Disaster Risk Reduction Management Council, 801st brigade commander Col. Leoncio Cirunay Jr. and PSupt. Oliver Cinco of Provincial Public Mobile Company PNP Catbalogan City during the evaluation and review after Simultaneous Earthquake Drill. CAMP VICENTE LUKBAN, Catbalogan City – The 8th Infantry (Stormtroopers) Division joins the Nationwide Simultaneous Earthquake Drill (NSED 2015) conducted at Samar Provincial Capitol, Catbalogan City at around 9:00 in the morning of March 27, 2015. 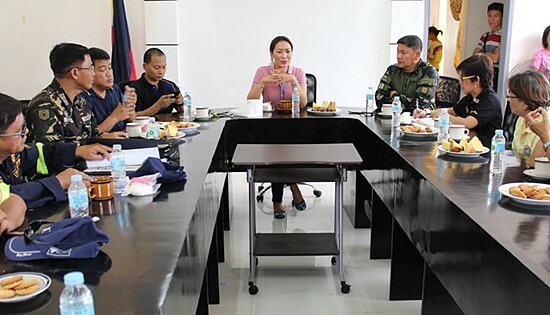 The drill was conducted in compliance with the National Government’s directive of increasing the province’s preparedness in the event of a catastrophic earthquake if such situation will arise in the future especially that Samar is situated in a disaster prone area. Sirens rang at 9 a.m. signaling that an intensity 8 earthquake struck Samar Province with its epicenter at the City of Catbalogan, severely damaging the Capitol Building. Immediately, responders established an incident command post (ICP) and conducted rescue operations, as well as search and retrieval operations in various scenarios. The activity was followed by a debriefing and after action review in order to discuss actions that necessitate improvements coupled with good disaster response practices that needs to be emulated. Further, plans based on the result of the drill were presented in order for the province to have continuity in its disaster response awareness and instill pro activeness to the people in dealing with a massive earthquake. The activity was spearheaded by Major General Jet B Velarmino, the 8ID Commander, Governor Sharee Ann Tan of Samar, PSUPT Oliver Cinco of Provincial Public Mobile Company PNP Catbalogan City, Rey Gozon of Regional Disaster Risk reduction Management Council, Col Leoncio A Cirunay Jr, the 801st Brigade Commander and other agencies and organizations that includes Bureau of Fire, Catbalogan City, Access 5, Kabalikat Civic Com, Office of the Civil Defense, Philippine Information Agency Region 8 and other attendees coming from the Provincial Social Welfare and Development and the media. On the other hand, Major General Jet B. Velarmino, Commander of the 8th Infantry Division, Philippine Army whose personnel and equipment were the main resources deployed as “first responders” during the drill, said, “We are willing to share the experiences of our units as well as the skills that we learned in disaster preparedness. I have personally seen and experienced the earthquake that devastated Baguio City in July 1990 and cadets of the Philippine Military Academy where the first responders during that tragedy. And we learned a lot from that experience. And today, we have that skill and resources to react on simultaneous earthquake situations that we can employ to prevent, if not mitigate loss of lives that this disaster may bring in our province”. MANILA – Ateneo de Manila University of the Philippines has edged out 20 other student teams from 15 countries across Asia Pacific to win the ninth CFA Institute Research Challenge Asia-Pacific Regional, and will advance to the global final in Atlanta, Georgia, USA, on April 17, 2015. Students from the Philippines continued their string of success in recent years. This year's win marks the third time that a Philippine team has been named Asia-Pacific champion -- the most wins for any country participating in the competition. Last year, the University of the Philippines, Diliman went on to win the Global Research Challenge Final. The CFA Institute Research Challenge is an annual educational initiative that promotes best practices in equity research through hands-on mentoring and intensive training in company analysis and presentation skills. After a semi-final round, only five of 21 teams advanced to the final round held in Manila on 12 March. Aside from Ateneo de Manila, the finalists included University of Melbourne (Australia); Symbiosis Centre for Management and Human Resource Development (India); National Taiwan University (Taiwan), and Thammasat University (Thailand). The five Ateneo de Manila University students -- Sarah Jane Cua, Jose Enrique Fausto, Shaun Wesley Que, Jayhan Regner, and Kyle Jemmric Velasco -- won for their "buy" recommendation on Concepcion Industrial Corp. Each student received a trophy, a CFA Program scholarship, and certificate. CFA Society Philippines, the CFA Institute member society in the country, sponsored the winning team as well as hosted the event in Manila. "We warmly congratulate Ateneo de Manila University for winning the CFA Institute Research Challenge Asia-Pacific Regional this year. They have proven their superior analytical, report writing, and presentation skills, as well as their commitment to the CFA Institute Code of Ethics and Standards of Professional Conduct," said Paul Smith, CFA, President and CEO of CFA Institute. "We remain committed toward nurturing young talent as part of our goal to foster the highest standards of ethics, education, and professional excellence among the next generation of investment professionals. We are grateful for the dedication of our local member societies and volunteers who serve as mentors to these students. I personally look forward to sterling performances from the Ateneo team again at the global final." Speaking on behalf of the winning team, Jose Enrique Fausto said, "We never expected to be here; but we're so thankful to God, our advisors and mentors, family, and friends who helped us achieve this incredible honor for our university and our country." Introduced in 2006, CFA Institute Research Challenge is considered as "the investment Olympics" for university students. This year, more than 4,000 students from more than 865 universities have participated in 99 local competitions and 137 local hosts in some stages of the challenge, which stretches from May 2014 to April 2015. QUEZON CITY – Just over three months after Typhoon Ruby struck the municipality of Dolores in Eastern Samar, many of the region’s farmers are now on the road to recovery and harvesting new crops following a farmer-to-farmer organic seed transfer. After Typhoon Ruby made landfall, a group of farmers from Cebu, Bohol and Negros collected ecologically farmed rice seeds, root crops, vegetable seeds and organic fertilizers. Together with Greenpeace, they delivered seeds to 125 of the most affected farmers in Dolores, making it the first seeds distribution in Dolores post Ruby. CAMP VICENTE LUKBAN, Catbalogan City – The 8th Infantry (Stormtrooper) Division, Philippine Army sent one of its Battalions to Mindanao in a send-off ceremony conducted at Catarman Airport on March 20, 2015. In a simple but meaningful program, the 34th Infantry Battalion was given a plaque of appreciation in recognition of their valuable services rendered to the people of Eastern Visayas. The Assistant Division Commander, Colonel Demy T Tejares, presented the Plaque to Lt Col Edgar Delos Reyes, the Army Battalion’s Commanding Officer as he received the award in behalf of the members of the 34th Infantry Battalion. 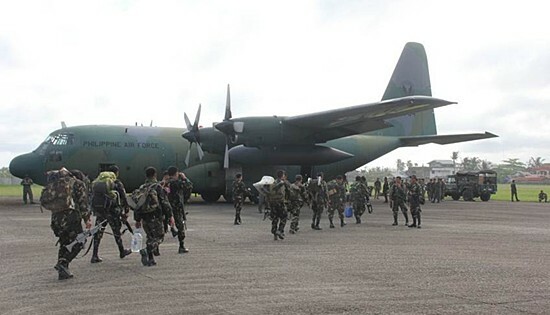 Along this line, Lt Col. Delos Reyes reported for completeness of his battalion which was immediately followed by inspection of troops by the Guest of Honor prior to boarding the Air Force C-130 plane. Col. Tejares in his remarks urged the troops to be disciplined at all times for they will assume new areas and engaged new people with peculiar culture. He urged them to put primary in respecting the culture of the people they are going to deal with as well as their rights as embedded in our constitutions. “I also served in Mindanao and I know the challenges that await you as soon as your battalion set foot in those ground. Don’t forget to be steadfast and make the 8th Infantry (Stormtrooper) Division proud of you”, said Tejares. The unit will be stationed in the province of Maguindanao, to support the ongoing AFP operations against the Bangsamoro Islamic Freedom Fighter (BIFF), Justice for Islamic Movement (JIM) and other Lawless elements which had been undermining, the peace and development efforts of the Aquino administration. NEW YORK – Model and entrepreneur Jessica Minh Anh marked her 9th history-making fashion show yesterday when she transformed the Hudson River into the world’s newest catwalk. J Spring Fashion Show 2015, which lasted nearly two hours, presented New York, as we all know it, in a new light. Visually pushing the envelope, Jessica Minh Anh created the illusion of models walking on water by having guests seated facing the multi-faceted glass windows of Bateaux New York and watch models walking in front of them while the boat was cruising. As a result, New York’s famous skyline and its architectural masterpieces such as the Brooklyn Bridge, Statue of Liberty, and One World Trade Center became the natural backdrop for the floating catwalk. Similar to Jessica Minh Anh’s previous phenomena on the Grand Canyon Skywalk, Eiffel Tower, and One World Trade Center, J Spring Fashion Show 2015 showcased a combination of haute couture, high-end ready-to-wear, luxury jewelry, and leather bag collections from 4 continents. Participating designers embraced tradition and culture, yet experimented with innovative techniques of modern designs. The highly anticipated catwalk opened with an exquisite haute couture collection by Japanese legendary designer Yumi Katsura accompanied by an even more impressive jewelry collection by Colombian-German talent Sonia Heilbron. Each look enchanted viewers with a burst of colors and unique craftsmanship in Sonia’s designs, as well as the spectacular embellishments, layers, and texture in Yumi Katsura’s long tail dresses. Both designers succeeded in marrying heritage with a new dimension of luxury and glamour. Adding elegance and sophistication to the grand catwalk, Eastern European representative Lesya Lozneva premiered an airy and alluring collection made of soft cotton, translucent organza, delicate wool, and smooth silk. Inspired by shades and patterns of nature, the Ukraine designer teamed transparent dresses in the colors of forest berries, deep sea, and sunset meadow, with stylish bodysuits. Also with a great attention to detail, Sabres Fashion House from Romania managed to bring in a refreshing perspective with a new collection called “Mystique”. The central European brand creatively presented sensuality using luxurious gold fabrics, hand painted motifs, intricate embroideries, and distinctive cuts. 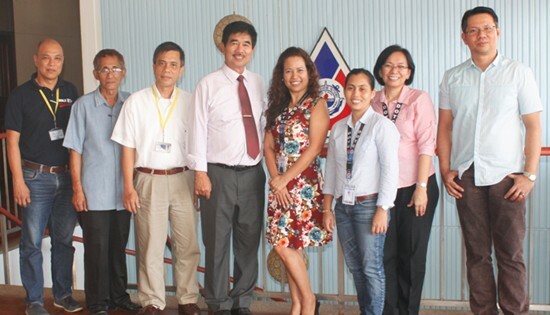 TACLOBAN CITY – On February 26-28, 2015, five (5) Standards of Training, Certification and Watchkeeping (STCW) for Seafarers Courses of the National Maritime Polytechnic, a government maritime training and research agency located at Brgy. Cabalawan, this City, underwent inspection as part of the accreditation process conducted by the Maritime Industry Authority (MARINA) STCW Office. The said five (5) courses are Operational Use of Electronic Chart Display and Information System (OUECDIS), Ratings Forming Part of Navigational Watch (RFPNW), Ratings Forming Part of Engineering Watch (RFEW), Consolidated Marine Pollution (MARPOL) 73/78 Annex I-VI, and Ship Security Awareness Training and Seafarers with Designated Security Duties (SSAT and SDSD). In the inspection, Specific Key Areas (SKA) were assessed against requirements which include the Program Implementation of each of the courses with regard to the incorporation of knowledge, understanding and proficiency (KUP) from the STCW Code; Qualifications of Instructor/s, Assessor/s and Supervisor; Teaching Process; Written Policies and Procedures in relation to program implementation; Course Intakes; Classrooms; Training Equipment; Books and Teaching Aids; Assessment System Manuals; and Quality System documents. Prior to the inspection, NMP had already structured a pool of accredited trainers and guest lecturers who will be handling the five courses as instructors, assessors and training course supervisors. Although satisfactory in several of the specific key areas, NMP is given thirty (30) days to comply with the minor deficiencies cited by the MARINA accreditors. The inspection team was composed of MARINA STCWO personnel and Maritime Education and Training Standards Supervisors (METSS) Marissa L. Dasmariñas, Capt. Samie Lou L. Sedurante, Presca Lee B. Lugo, and Engr. Ronnie D. Gernato. NMP is set to submit for accreditation nine (9) other courses which include Basic Training (BT) with four (4) modules, namely, Fire Prevention and Fire Fighting (FPFF), Personal Survival Techniques (PST), Personal Safety and Social Responsibility (PSSR), and Elementary First Aide (EFA); Advanced Fire Fighting (AFF); Proficiency in Survival Craft and Rescue Boats other than Fast Rescue Boat (PSCRB); Prevention of Alcohol and Drug Abuse in the Maritime Sector (PADAMS); Ship Simulator Bridge Teamwork with Bridge Resource Management (SSBT with BRM); and Medical Emergency First Aid (MEFA). Meanwhile, NMP continues to offer its Faculty Development Courses (IMO Model Course 6.09 Training Course for Instructors; IMO Model Course 6.10 Training Course for Simulator Instructors and Assessors; and IMO Model Course 3.12 Assessment, Examination and Certification of Seafarers), and other upgrading courses for marine officers and ratings such as Marine Electrical System (MES), Marine Refrigeration and Air Conditioning (MRAC), Maritime Law for Ship’s Officers (MAR LAW), STD/HIV/AIDS Prevention in the Maritime Sector (SHAPIMS), Prevention of Alcohol and Drug Abuse in the Maritime Sector (PADAMS), and Gender Sensitivity Training for Seafarers (GSTS).